Good quality at an excellent price. Recipient was very pleased with this item. A structured stand collar with a fully lined zip-off hood lendsadded style and warmth to this leather anorak from Excelled.Horizontal stitching creates the look of a banded waist whilefoldover cuffs complete the versatile look. The approximate length from the top center back to the hem is 30inches. The measurement was taken from a size medium. This jacket is incredibly warm and the longer length protects from arctic elements extremely well. As a Florida resident, I dislike being cold and as I travel often to very cold climates for work, wanted some real protection. This jacket has a zip out lining and zip off hood, as well as turn-up sleeves for those of us who have shorter/longer arms. It is a terrific jacket all-around and probably the best jacket purchase I have ever made! Highly recommend buying this jacket--the price is incredible for what you get! The sleeves were long, and rolling them up more just didn't look right. It was boxy, tight around the hips. Didn't like the quality of the leather. great coat for the price! I love this coat! The fit is perfect, the leather is high quality. I have only worn the coat without the zip-out lining because the weather here in up-state NY has not been cold enough to require the extra lining, but I am sure that this coat will be warm enough for the coldest temperatures that Mother Nature can dish out! As stated, above, I was disappointed in the leather, but the size and color and warmth were fine. As always, Overstock.com's service and ease of return were exceptional. 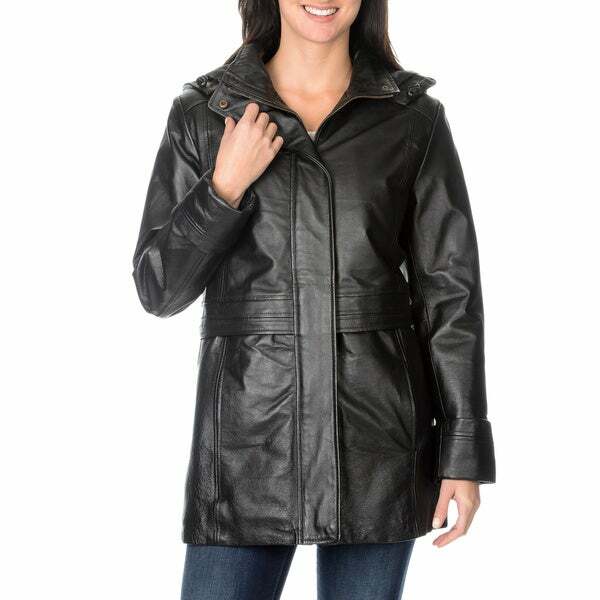 This leather jacket will be perfect for formal evenings in cool weather- 40 degrees or so. It is so comfortable and it looks fantastic - great price!!! Sizing is spot on. Very nice leather jacket. I wear it in chilly and freezing cold weather. Keeps you warm. I didnt like the way it fit or looked on... looked like a man's jacket no curves at waist. Didnt care for. I returned. I am pleased with this jacket. I didn't wear it yet but looking forward to doing so when the weather changes. It is sized pretty accurately, somethings I wear an XL with this car a large worked just fine. It is warm. Very heavy duty. Almost too heavy to wear at times, but very warm. I wanted a heavy car coat and it is! Sleeves adjust, but still a little long. I am happy with it. I like the coat but the arm are to long. The fit in the arms was extremely small and uncomfortable. The rest of the jacket fit ok, but the sleeves were unrealistically small. What was more disappointing is being charged for the return shipping, and being told that I would have to purchase another coat and wait for the refund on my card. I went to Kohls and bought the same style coat, better quality for the same price, with a free exchange policy! Great price was looking at one on another site. "can I get the wine colour in this jacket? Only black comes up when I try to order?" Hello adelaide14, I am very sorry but we do not currently have the wine color available. Thank you for shopping with us. "what kind of leather is this one?" Thank you for your question. I love this jacket! The leather type is Pig Nappa.